Drawers feature metal glides for smooth, reliable drawer function. Metal glides allow you to open and close drawers with ease, sturdy enough for heavy or frequent use in your home. 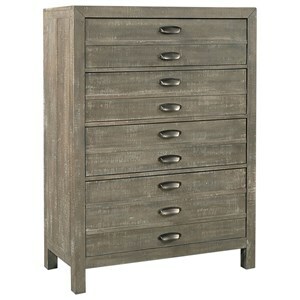 Tastefully designed, with ample storage space as well - what else could you want out of a bedroom piece? You'll be getting another option for organizing your clothing while also adding some style to the room at the same time. The Lucerne Transitional 5-Drawer Chest with Metal Drawer Guides by Progressive Furniture at Van Hill Furniture in the Grand Rapids, Holland, Zeeland area. Product availability may vary. Contact us for the most current availability on this product. Storage 5 drawers in total. Weahtered paint and sliding doors on the bed and dresser are meant to resemble the traditional look of barn doors, giving your space the slightly rustic look that is growing more and more popular these days. The Lucerne collection is a great option if you are looking for Rustic Transitional Rustic Transitional furniture in the Grand Rapids, Holland, Zeeland area. Browse other items in the Lucerne collection from Van Hill Furniture in the Grand Rapids, Holland, Zeeland area.